← Help Me Out Here: Blue Cheese Ice Cream, Why? Candied fruit is something I historically associate with my grandmother. For many years when I was growing up she would make Christmas cake. Which was odd as my grandmother was not so into baking or cooking. That she bothered to make a large batch of Christmas cake, every year, months in advance of the holiday and soaked and re-soaked them in booze every couple of weeks, was very impressive to my 6 year old self (and in retrospect to my 54 year old self). My grandmother bought all her candied fruit. It never occurred to me until years later that you she could have made it herself. But then, why would you want to make it? To use in what way? Seasonal fruit cake has limited appeal and is on a lot of my friends’ must avoid lists. If you are going to make them so even your skeptical friends might like it you are going to need to make it from fruits and peels you have candied yourself. However it wasn’t fruit cake that motivated me to candied orange peel, it was a recipe for Honey Ricotta Ice Cream. Pastry Chef and Ice Cream Maker Extraordinaire David Lebovitz posted a recipe on his wonderful blog inspired by a recent trip he’d taken to Sicily. The recipe calls for orange or lemon peel and pistachios and then he finishes the ice cream with cherry sauce just before serving. I ask you, what could be bad? For what ever reason the few times in the past I made candied fruit peel it never really turned out very well. I was annoyed by how long it took and only ever made it for this one Florentine recipe I use to make. 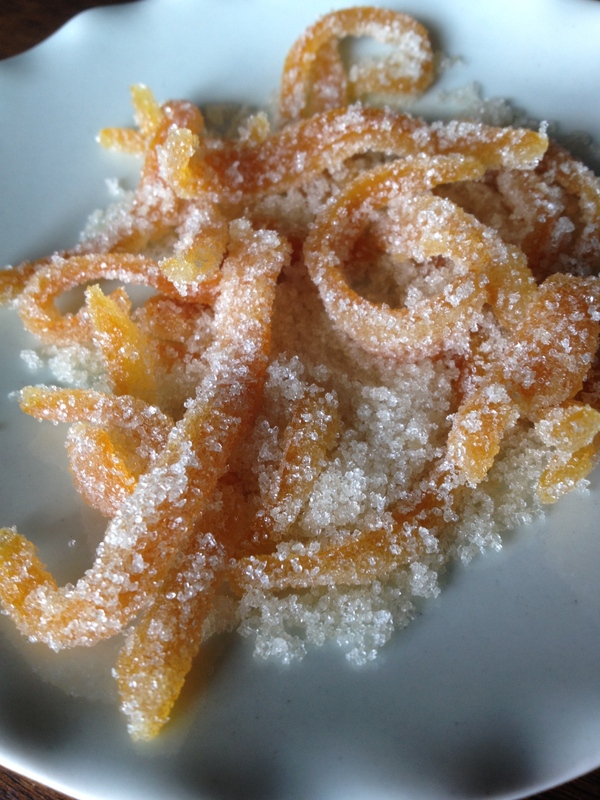 I never really mastered the art of candied peel making. I decided I needed to finally figure it out. And with some patience it was actually pretty easy. 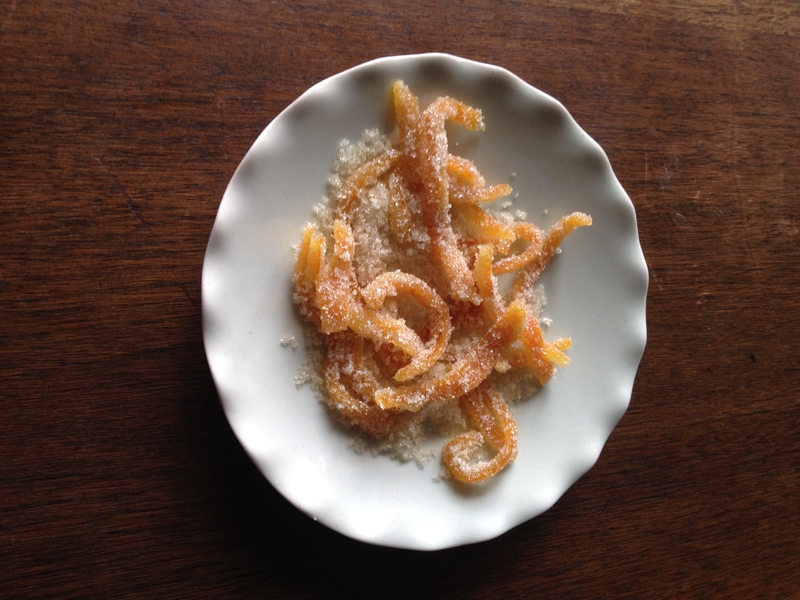 The best part about this experience is that I learned once you’ve made the candied orange peel and you have it in a container layered with sugar, it will last in your fridge for ages. First you need to start with organic fruit so you don’t have pesticide soaked peel. Cut 4 oranges (I used navel oranges) into quarters and with a paring knife remove the fruit and as much pith as you can. 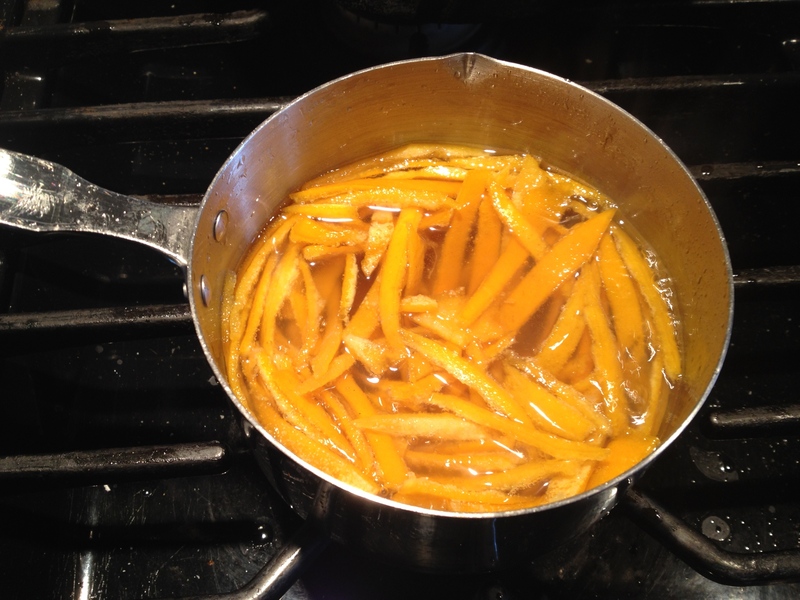 Place the peels in a stainless steel sauce pan with enough cold water to cover. Bring to a boil, reduce heat and simmer until the pith begins to look translucent. Turn off the heat and let sit in the hot water for about 15-20 minutes. Drain and let cool. In a small saucepan add: 1 cup Sugar, 1/2 cup Water, 1/4 teaspoon Cream of Tartar bring to a boil and cook until the sugar has completely dissolved. Turn heat down to low. Remove the pith from the peels with a spoon and cut into strips. Add to syrup and turn the heat up to a slow simmer. When the peel starts to look transparent and is tender (about 20 minutes) turn the heat up and cook until the syrup has reached 230 F on a candy thermometer. 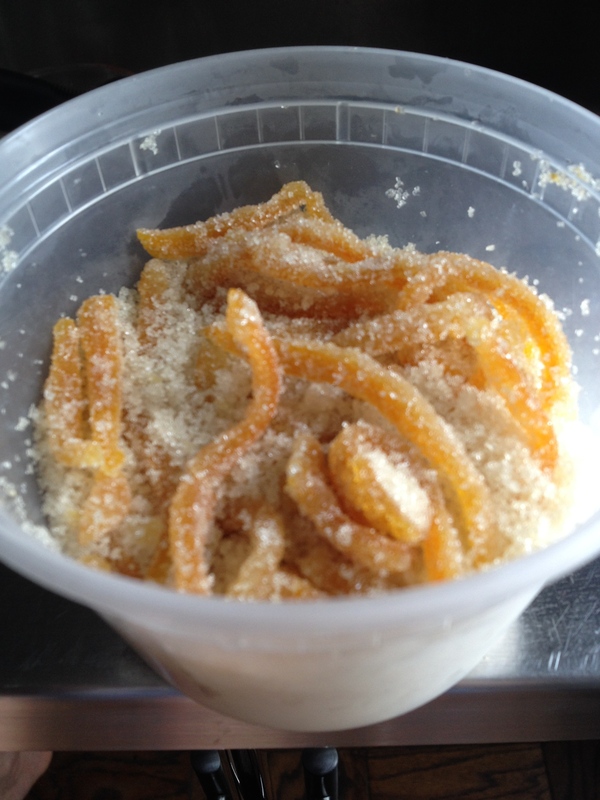 While the peel is cooking, cover a plate with a cup or more of sugar and get a mesh sieve ready over a bowl. 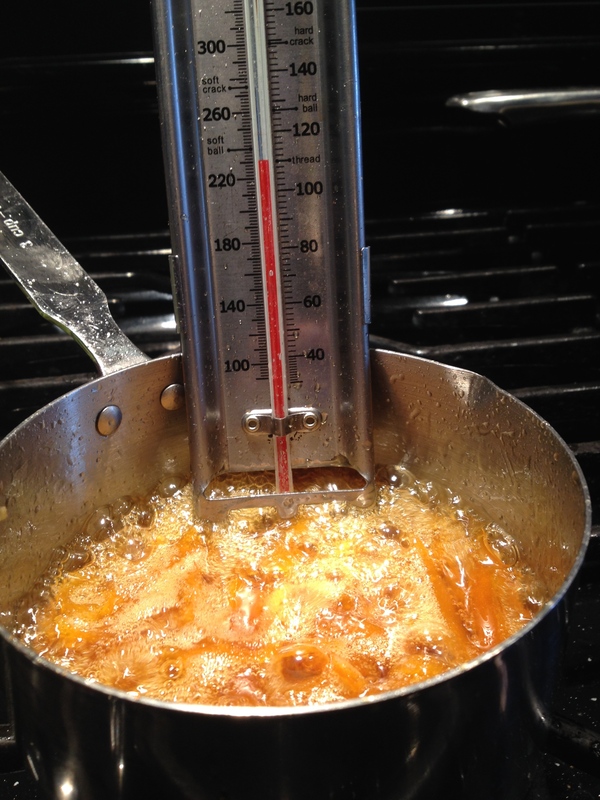 Once they reach 230 F remove from the heat and strain them (the syrup is delicious and hardens as it cools). 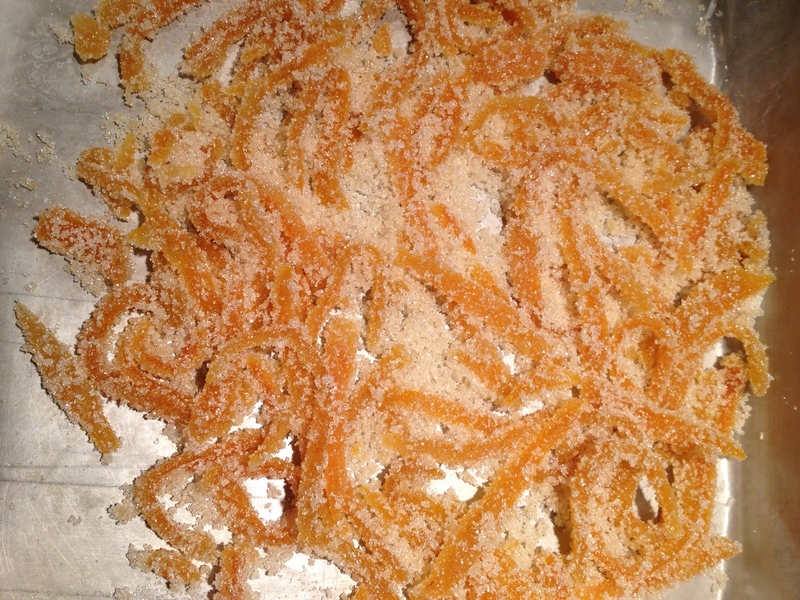 Roll the candied peel in the sugar. 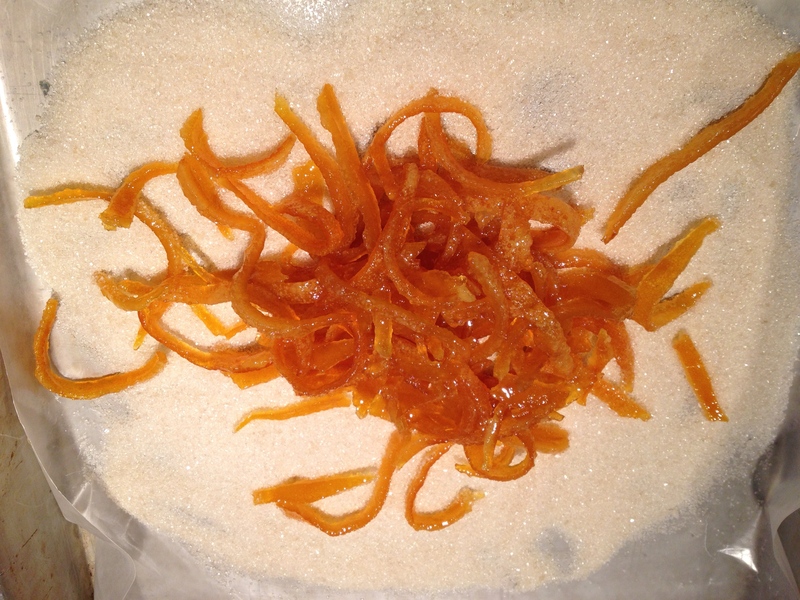 Store in an air tight container in lots of sugar in the fridge for the next time you make fruit cake, or ice cream, or want to dip them in chocolate….candied peel not just for fruit cake. The Ice Cream turned our great, I added a tablespoon of Dry Curacao (Grand Marnier or any orange flavored liquor would work) to mine and used salted pistachios. Next up candied lemon, then cherries, and then I will almost be ready to make my Barrel Aged Rye Christmas Cakes! This entry was posted in Recipes and tagged candied fruit, candied orange peel, David Lebovitz, Dry Curacao, honey ricotta ice cream, Orange Peel. Bookmark the permalink.